Planners aren’t just for grown-ups! I know it might seem silly or strange, but kids really can benefit from having a planner of their own. When Teen was in kindergarten the school district he was in made it mandatory that all students be issued a planner. Now, I thought kindergarten was a little too early to start, and they didn’t keep track of a whole lot in kindergarten. As the years went by they started using them for more and more things until the planner became a tool for them not just something I had to initial each night. I’m not sure if it’s just our school district, but Liam’s school doesn’t do planners in the early grades. I want him to learn how to use this sort of tool early and even if I am the only crazy parent out there who feels this way, I thought I would be fun to make some planner printables for kids and share them here with all of you. When it comes to leaning new skills or creating new routines, the best approach is often to take break it down into baby steps. Introducing the concept of planner to children is no different. You start them out using their planner for one or two things and as time goes on, bit by bit, you start adding to those. 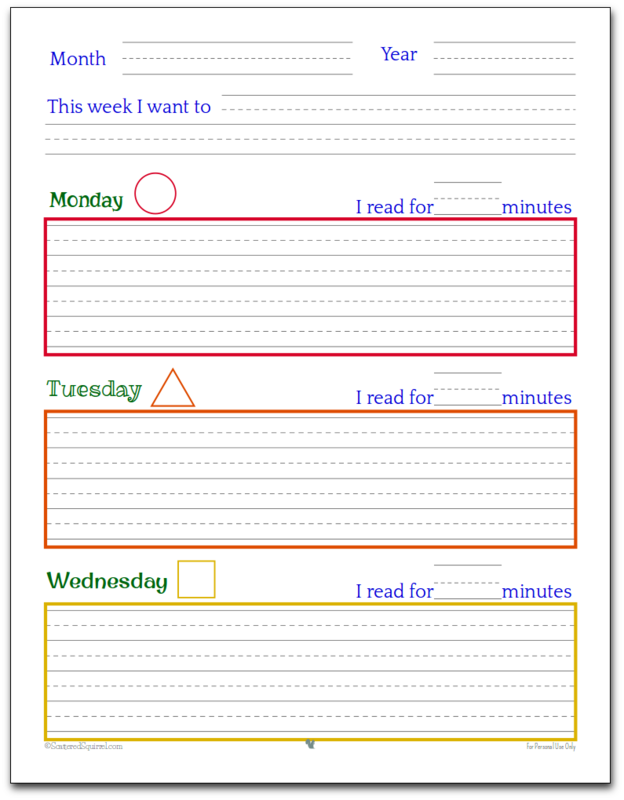 A basic planner is a great way to start teaching time management skills. The early we start learning new skills, the more ingrained and habitual they become and hopefully, the less our kids will have to work on them later in life. I am a big believer in teaching kids life skills early. Both my boys have helped out around the house since they were little with age appropriate chores, and they learn a little more about how to care for and clean a home each time I introduce them to a new chore. Time management is the same way. Last week I shared a kid friend to-do list printable, that I’m using to help Liam manage his own time for Spring Break. He’s loving using it, and I’m enjoying watching him take ownership of his time a little more. It doesn’t mean I’m not still creating activities and playing games or anything like that, but it’s gotten him thinking about the things he’s doing each day, and how to create time for the things he really wants to do. The next step, in my mind is to introduce a planner to him. He’s almost 8, and I think he’s more than ready to start learning about this tool and how he can use it. The key to teaching our kids about how to use a planner is no different from teaching them anything else, we just need keep it simple and try to make it fun for them. With that in mind I tried to keep the planner printables simple and easy for kids to use. The first page has room for them print the month and year at the top of the page. Underneath is room for them jot down what they want to do that week. This part is great for teaching kids about goal setting, and is a great opportunity to strike a conversation about how they think they can do that. For example, your daughter writes down that she wants to have her best friend come over to play. You could ask her to think about what she needs to do to make that happen. Talk it out with her, I’m sure step one is to ask you if it’s ok. What does she need to do next? Maybe she needs to choose a day? Ask her friend? It’s just a conversation, but while you’re talking you’re teaching. 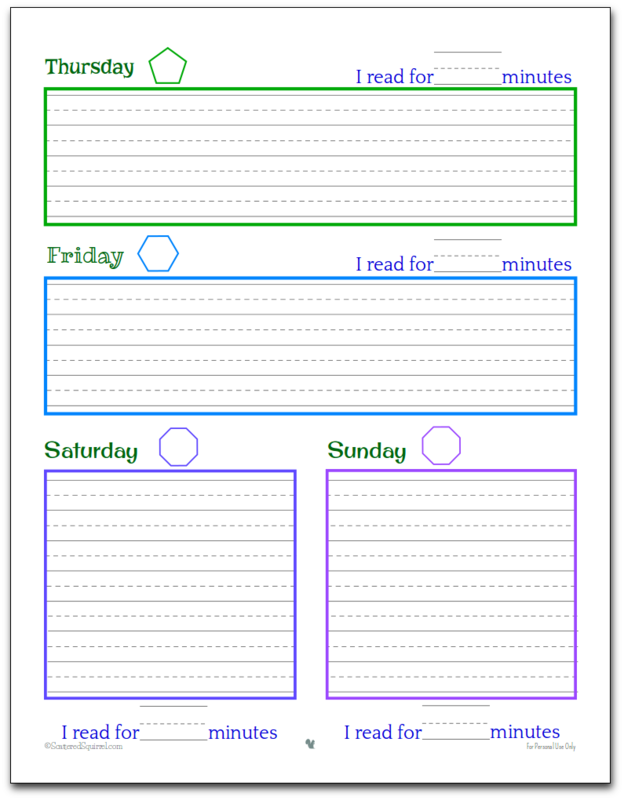 Each day of the week has a shape beside it so that the kiddos can mark down the date inside. Beside that (underneath for the weekends which you will see in a minute) is a space to log how much time was spent reading that day. We aim for 15-20 minutes per day as part of a school wide reading program, but you could choose to skip this part if you want. Next comes the boxes each day. How your kiddos use these sections is totally up to you. There are so many different things they could jot down to keep track of. extra-curricular activities like sports, brownies, scouts, etc. How they use this space, or even if they use this space, is totally up to you and them. The point isn’t to have them plan their days, it’s just to get them thinking about planners and possibilities. Just like each of us use our planners in different ways and for different things, our children will use their planners for different things, especially when they are just starting out. It’s important to remember that there are no wrong ways to use a planner. If you keep it simple, make it fun, and take small steps you’ll be helping them build a strong foundation that they can build future time management skills on to. Do you think your kiddos would like these planner printables? Would they have fun with a planner all their own? I’m linking up at these great places around the web. I love these Alli! Our kids have an agenda for school but I’m working with my son to help him start using it as a planner. Early stages but good skills to learn. Next year he’ll be in middle school and if they don’t have agendas or planners from the school I’ll definitely print these out for him. Thanks for sharing them! I think it’s important for kids to be introduced to these tools early. They help in so many ways later on in life. Even a monthly calendar where they can write down their own appointments and activities is a good place to start. Alli, you have done it again! This is genius! I do not have school age children in my home, but I do have children with young students in their families. like you, I am an advocate for obtaining the best for kids and my grandkids deserve the kind of help that will serve them as they proceed in school. May I please have your permission to reproduce this for a neighbor’s children. No, they are not struggling in school, but they do tend to forget things. Getting them into the student planner habit could go a long way toward keeping them on track. I love the way the days are accented with color and that there are the kind of lines that a young child can use to notate things that need to be done. The reading notation is a huge bonus. For any number of reasons, some student just need a “prompt” to help them get extra reading time into their days. 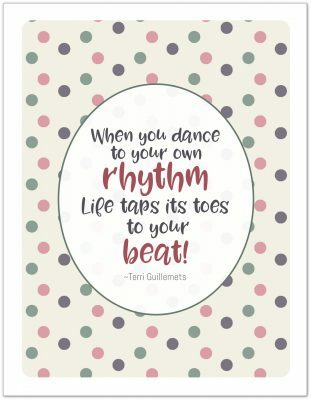 Your printable “fits the bill” on so many levels! I’m happy to hear that you like the planners. You most certainly can gift some to your neighbor’s. I think that’s a wonderful idea. Our youngest just headed back to school this week after spring break, so we’re going to start using ours next week. Let him get adjusted back into the school routine before I toss something new at him. He’s really excited about having his own planner. My kids’ schools start planners in third grade. The kids all use them, but I don’t think they necessarily use them well. we need to work on that! Stopping by from the Home Matters Linky party! I used to be an elementary school teacher and I love these! Awww, thanks. My youngest is excited to using his, even though he doesn’t have homework.